So here we are in Acts 2. The Apostles have stayed in Jerusalem at the Lord’s request (Acts 1:4). Jerusalem is the launching point for the gospel to go to the whole world (Acts 1:8). They have been with the risen Christ for forty days before he ascended into heaven (Acts 1:3) and now they have waited another ten days for the Holy Spirit to come (Pentecost occurs 50 days after the Passover… Jesus was crucified at the time of the Passover). 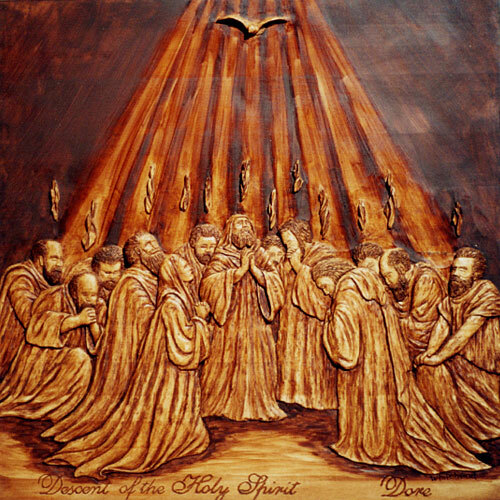 I’ve written before about Pentecost, you can read a brief PDF here. As we anticipated yesterday something amazing happens because the disciples were obedient to the Lord’s command. The Holy Spirit comes, they preach, and three thousand souls are added to the church that day (2:41)… They are indeed fishing for men (Luke 5:1-11). What is truly amazing is that through the power of the Holy Spirit each person is hearing the gospel in their own language. It’s the tower of Babel in reverse (Genesis 11:1-9). At the tower of Babel God had confused the language of the people because of their sin and rebellion. But now Jesus has made the ultimate sacrifice for sin. He is calling lost sinners to come home. He speaks to them through their own native language here in Jerusalem and ultimately the gospel will reach to the very ends of the earth (Revelation 5:9). What was done at Babel was coming undone. What’s compelling here is that these men, the Apostles have come to Jerusalem. It’s not their home. This point is driven almost to the point of absurdity when men of the crowd recognize them as Galileans (2:7). This was a big deal the day because Galilee was a somewhat recently resettled state of Israel. They would have had the reputation of back wood hicks (John 1:46) and probably looked and talked differently than the folks in Jerusalem (Luke 22:59). At this point you’re probably saying, I get that they were from Galilee… What’s the big deal? Exactly! You’re supposed to ask that! You are supposed to see that the disciples didn’t go to their home first (in all fairness they had already been there through the years of ministry with Jesus)! They went to the city and they went to the city on the day that everyone from all over the world would be there. The gospel went to the nations by way of Jerusalem because the nations were in Jerusalem that day (2:-11)! I think the bigger point here is to obey God (even in the small things) after all it’s His plan. Yet how often do we put our confidence in the flesh thinking WE have a snazzy plan… of course our snazzy plan usually discounts the Spirit of God and chalks things like a language barrier as impossible to over come or at least a long way off. Can you imagine if the disciples had packed it in and tried to gain a stronger foothold in Galilee?